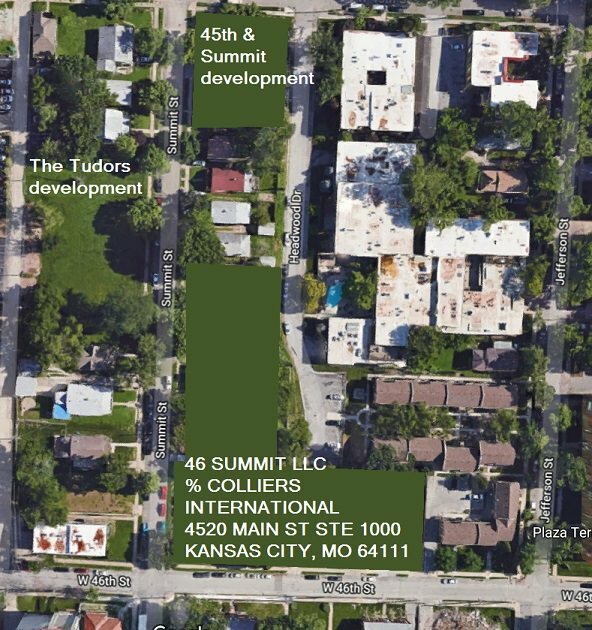 New documents have shown up in the KCMO Development Tracker for the 46 Summit, a 67 unit apartment project. 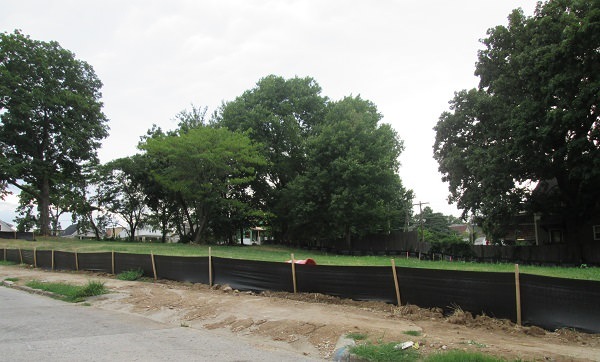 This is on the northeast corner of 46th and Summit so it will involve tearing down some small bungalow houses. When this project was first announced, I had assumed it was for the southeast corner of 46th and Summit, where the Colonial Court apartments were torn down. This project is being developed by Price Brothers, who also own (or maybe owned, as it has been up for sale), the Colonial Court site as well. To further confuse things, the once proposed redevelopment for the Colonial Courts was once called 46 Summit, as well. That called for a 8 or 9 story building with 246 units. This went to the Planning, Zoning & Economic Development Committee last week. The project is getting a bit larger - same number of units but increased bedroom count and an added floor on Summit. Those elevations already show 4 floors on Summit, so I guess it is just getting approval for that. Patty Noll, City Planning and Development, gave the staff report on the Ordinance. The development plan approved in 2016 proposed construction of a three and four story multi-family residential structure with 67 units. A mix of one, two, and three bedroom units offer a total of 99. The current plan continues to propose 67 units but increases the number of bedrooms to 129. This is possible due to the additional level (four vs. three levels) on Summit Street as well as deletion of a proposed swimming pool. Parking count will simultaneously increase. 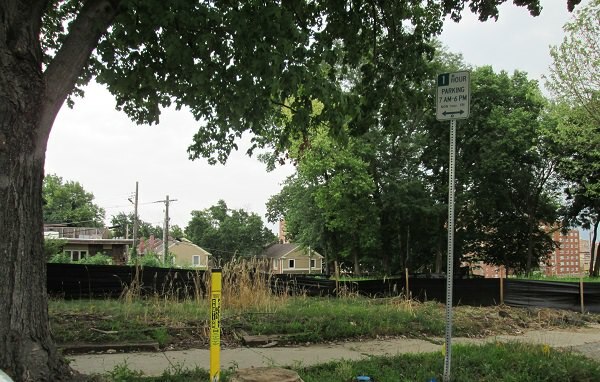 All of the remaining homes on this site have been demoed. 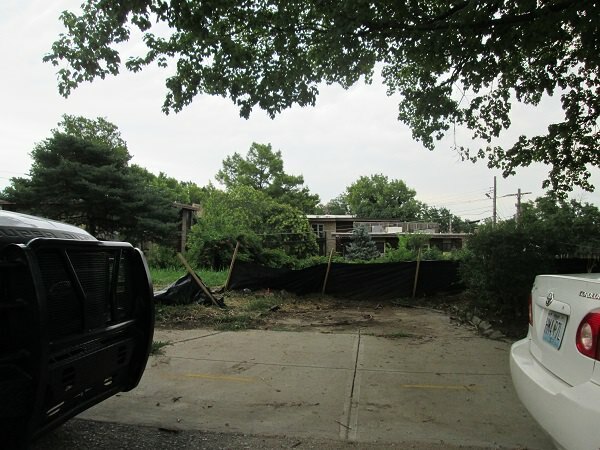 There are still a bunch of trees to be removed and other site work to happen. Looking NE at 46th and Summit. Looking NW from W. 46th Street. Looking east midblock on Summit between 45th and 46th streets. 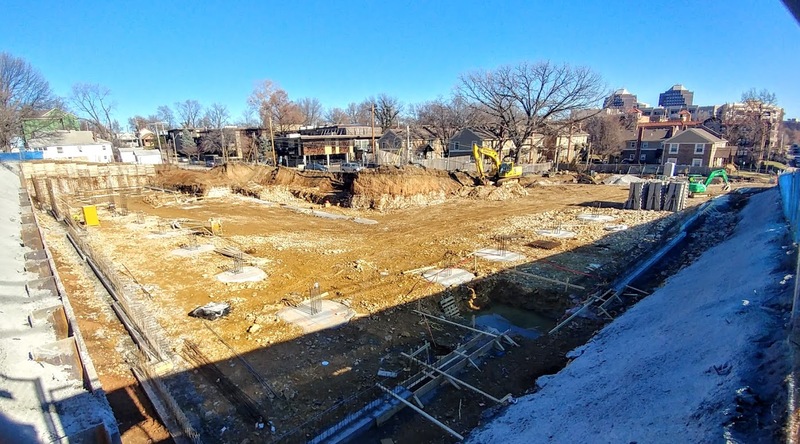 A plan by developers Doug Weltner and Bryan Johnson has earned unusually clear support for a 67-unit apartment building just north of the Country Club Plaza. The Kansas City Plan Commission on Tuesday unanimously approved the 46Summit proposal, buttressed by letters of support from several neighborhood groups. 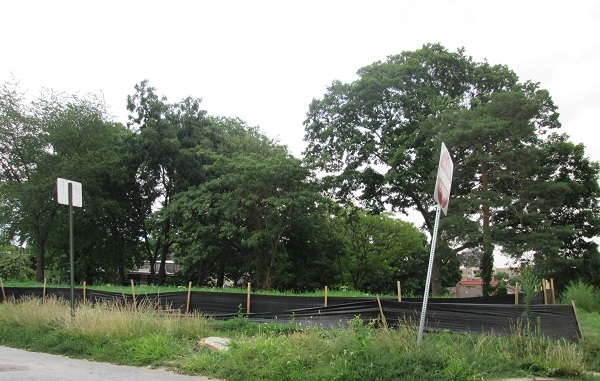 The plan is scheduled to go before the City Council’s Planning & Zoning Committee Wednesday. Commissioners approved the L-shaped, three-story apartment building on what is now partly vacant land after no one testified against it. That’s a marked difference from several other recent apartment proposals for the Plaza area, one of which was killed by public opposition. Several letters of support were entered into the record. 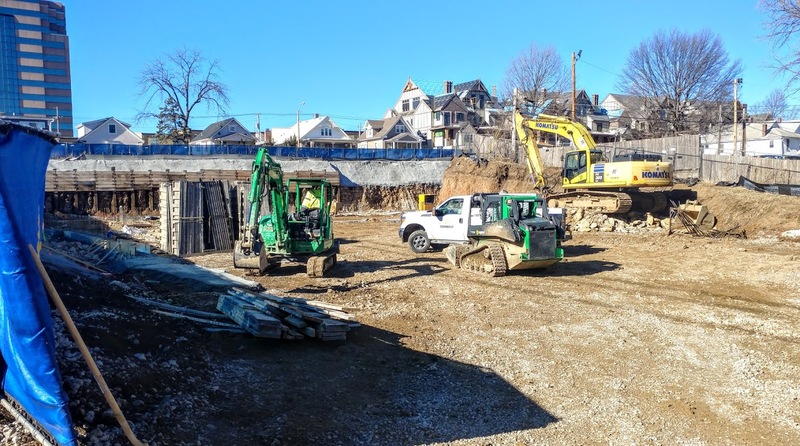 102 parking spaces for 67 units and no retail? I guess that's what the (home-owning) area wants. 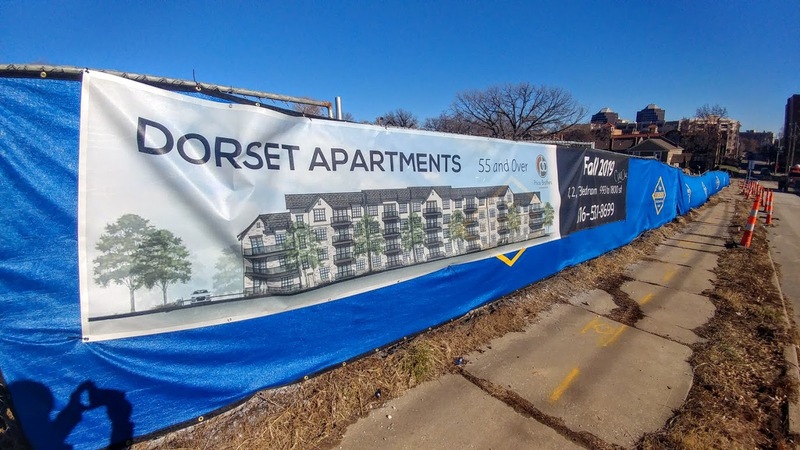 This project is now called Dorset Apartments and will be 55 and over senior housing (I don't recall that ever being mentioned before).